Middle Grade Authors Love Teachers Giveaway #MGAuthorsLoveTeachers, 2016 – Be someone's hero. No cape required. It’s no secret to those of you who know me that I just adore and respect teachers and librarians who are out there every day with kids–reaching out to them with just the right book or just the right conversation and changing lives. As is often said in children’s literature circles, books offer both mirrors and windows to readers. We often discover things about ourselves and/or who we want to be through reading (mirrors). 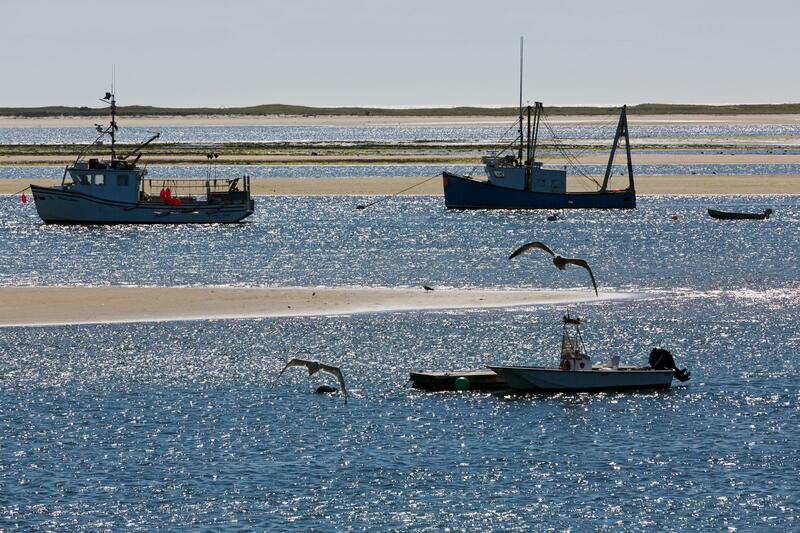 We also learn about the world–other cultures, ways of life, opinions and learn to empathize with others (windows). For some, a book offers a friend and the ability to revisit that friend as needed. Yes, we write the books. but YOU put those books into the hands of kids every day. We are a team. So…to express this appreciation and love for ALL of you heroes/teachers/librarians out there, I have banded together with some author friends (THANKS to you all for your kindness and generosity!) to offer one GIANT giveaway for one lucky winner. The winner of this giveaway will receive a signed copy of every single book below–each mailed to you in separate packages. Several are new releases, so the winner will be ahead of the game reading-wise in 2016! You may click on each cover to see more information about the book and its author. 1) Make a comment on this blog about anything book-related or kid-related. Or teacher/librarian related. Or anything-under-the-sun related. 🙂 *Please provide twitter handle or e-mail address with your comment* Also, if you share elsewhere online (Facebook, Google+, etc.) please let me know here. 2) Share to Twitter with the hashtag #MGAuthorsLoveTeachers I know–long hashtag 🙂 But it will help us find your entry! Please include link, if possible! Rules: ***Giveaway ends on Saturday, February 20th at 11:59. Winner will be announced Sunday morning. ***2) We know that teachers do not always get the appreciation they deserve. (They deserve parades and serenades and major awards.) This giveaway is a reminder that WE appreciate you. Yes—we write the books, but YOU get the books into the hands of our readers. Together, we are creating life-long readers. For that we are most grateful. Next Lifesavers Don’t Always Come in Rolls – Happy Teacher Appreciation Week!! What an amazing line up!! Yes, I try each and every day to put the right book into each child’s hands but it’s thanks to you the authors! With all of your different styles and topics, you make it happen! Lynda, I’ve said it before and will continue to say it, FIAT needs to be read by every teacher, everywhere! It’s that powerful! Wow! What a prize- so many of my favorites and ones I am looking forward to reading! Thank you for writing the books that get middle grade students excited about reading. As usual Lynda you have out done yourself by organizing sucha fabulous give away for teachers an librarians! You are not only a gifted writer, but a truly kind person! Good luck to everyone! So many of the books on this list are books that should be read by everyone not just our Middle grade kids. Although they sure do make our middle grade kids better people in the long run! I am in awe of this list of books! Another great give-away! Authors are so generous! What a wonderful gift…the gift of books! Lynda, you are such a special person! How fun! I host a Mock Newbery Book Club and these would be great additions! I have read a few & look forward to reading the rest! We are so fortunate to have authors that want to help our students grow as readers, writers and people! Thank you! This is an awesome giveaway. I have several of these books in my classroom. One for the Murphys looks a million years old. It is a very loved book. One of my favorites too! 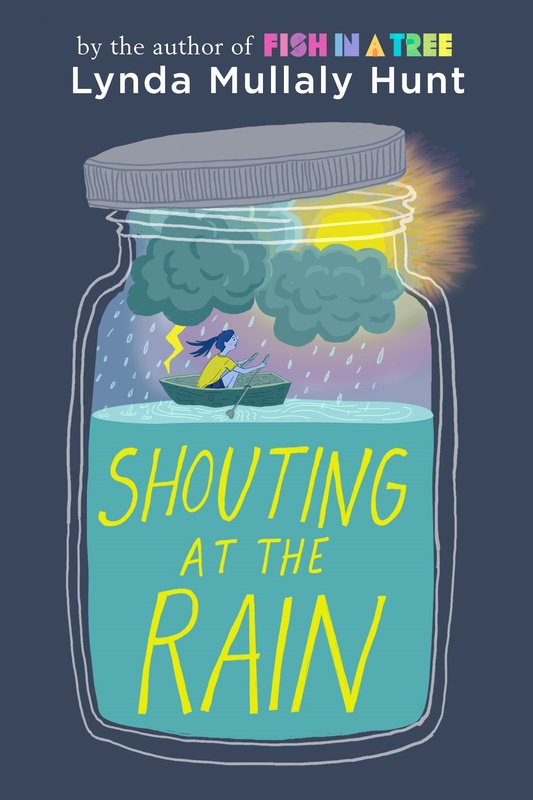 What a wonderful list of middle grade books! Thanks to all the authors who have contributed! Linda, your books have been such an inspiration to my class for the past 2 years. There have been some emotional tears when reading your books. 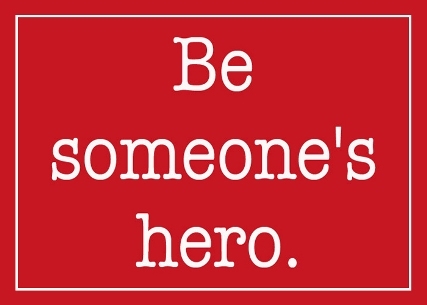 Be someone’s hero, no cape required is posted in the front of my room.This is an amazing giveaway. Thank you so much. What an amazing giveaway! Many of these books are on my students “favorite books of all time” list and the new ones look amazing and must be fabulous since they are in such good company. We (a mixed age group of rural 3rd-4th and 5th graders) are so grateful for our GRA experience this past fall with Fish in a Tree. Looking forward to the next book Lynda Mullaly-Hunt, whatever it may be. Reading aloud to my students is my absolute favorite time of the day. And it happens to be one of theirs as well. This list of books is AMAZING! Wonder and One for the Murphys have been favorite read alouds and Fish in a Tree is on our coming up stack. Jennifer Nielsen is a favorite amongst my boys and I have The War That Saved My Life on my wish list. And other new titles to add to my list!!! These 30 books have the potential to change lives. Thank you for this generous giveaway. As a librarian in a Title I school community it is so meaningful to help readers find books that make personal connections. So many fabulous books by so many generous authors! Thank you so much for giving our readers such wonderful reading material. You are rockstars! We are just about to start a book club in our Learning Commons. I know exactly which books we would start off with if we were to win this fabulous collection! This is my first year as a librarian after 20 years as a classroom teacher. I feel like I hit the jackpot! BEST.JOB.EVER. What a wonderful idea! What an amazing set of books! So exciting! Thx! The only greater love than books for a librarian, is to see that same love in their students. These are wonderful books, thanks for holding this contest. My classroom library is the number one, most important thing I provide my students. I tell them if they want to be smart, if they want to succeed, they must read! Great giveaway! What a fantastic and much appreciated giveaway! I teach 4th grade and vowed that books would be central to my teaching. We don’t go a day without getting into books. One of my boys (who I had last year in 3rd grade) is a very reluctant reader. After trying series after series after book after book, I finally gave him The False Prince by Jennifer Nielsen. He devoured it and kept coming back for more. I emailed Jennifer about him, and she was amazing-she sent him a personalized copy of The Shadow Throne. It was a life-changing moment for him. He’s now first in line for any new books that we get. Such a great package of books! A very generous prize to a lucky educator. It is so much easier to hook students on reading when you have fabulous books to offer students in your classroom and in your library. Thanks so much for running this draw and for your presence in classrooms everywhere during GRA and at other times as well. There are so many incredible books in this list! I know so many kiddos who would love to read these! Either way, so many of these are going on my need-to-buy list! Being a special education teacher, I am constantly looking for ways to motivate and encourage my students to do something they don’t do well…READ. Social media, like Twitter and Facebook, has helped me connect with authors and I have used this avenue to increase my students’ interest in books and reading. When my students see comments from the authors about the books I read and share with them, they get just that much more excited. I cannot wait to share this Giveaway with them! They are going to be crazy with anticipation to hear who wins. I hope it will be us! I love reading the books that the students are reading. It opens up all sorts of communication opportunities with them! Amazing! Speechless…what an unbelievable opportunity for someone. Would love to share this with others. Connecting readers to authors is my favorite part of World Read Aloud Day and Skype in the Classroom! Also love connecting students to the books they love! This collection would definitely help me get these great stories into the hands of my students! So many of my favorites included in this giveaway! Thank you for the giveaway!! Your thoughtfulness & generosity is appreciated! Kids are what makes my world go ’round and books are the ❤️ of our classroom! Thank you to all of the rock star authors who have been so generous in donating to this incredible giveaway! Wow!! What a great list of books! And so generous of all those authors to give away a copy of their book. I’ve been teaching for 17 years now- 6th grade. One thing hat Improde myself on is my class library that I’ve built over the years. I love to read and when I finish a book I share it with my students and try to get them excited about picking it up. To date, I have close to 1700 books in my classroom with a library system that allows them to check out books as they please. I love, love seeing books in the hands of my students and witnessing their excitement and conversations that come from reading books. Thanks again for your generosity of showing your appreciation for educators and librarians. This is an outstanding list of literature—a treasure for anyone to receive. Thank you for offering! A good book transports the reader to another world. I have read a few of these books and absolutely love reading them to my students. Thank you for thinking of the educators who recognize how powerful words are for their students. Whoa! What an incredible collection! What I find so powerful about novels for the middle grades is that quite often, children no longer listen to the adults in their lives as carefully or as closely as they do their peers. A book has the power to help children forget who is “speaking to them” and will instead hear the message of the characters. By using them as a read aloud, we have the opportunity to share important messages. When I see children for behaviors or problems, books become a part of the solution. Thank you for your work and for making this giveaway possible! Books will always be my Valentine. As an awkward gifted introvert, I felt out of place everywhere but a library. My grade school librarian, Mrs. Inesch, honored my live of reading by allowing me to read new books first. I relished being the first student to write my name on the little card…it validated that I mattered at a time when I felt I had no friends. Fast forward all these years and I still hang out in my school library when I’m not teaching! This is such an amazing group of books! As I was scrolling through, I thought of a student’s name for every book to read! I also love that there are a lot of genres in that selection of books! I would love to give these away to my students! Holy cow! What an absolutely amazing collection of books. There are so many of these books and authors that have turned students on to reading in my classroom. We are currently reading Paper Things and One for the Murphys in reading groups. Yesterday when a boy finished OFTM, he came to me with teary eyes, voice shaking and said, “I just finished”. It is moments like that that I live for as a teacher. Fish in a Tree was a perfect choice for the GRA and my class loved reading it and watching the videos. I have a boy who loves all of Nancy J Cavanaugh’s books and another student who finished Counting Thyme this week. We are excited to connect with Sarah Albee for WRAD next week. There are so many of these 2016 titles that I can not wait to get in the hands of my fourth graders. This is an incredibly generous giveaway and I will be thrilled for anyone who wins it. Thanks to all the authors for all you do! I just finished watching a TED talk about how one caring adult can be the difference and help a child be a success rather than a statistic. As a teacher, I witness my colleagues do many heroic things for their students such as bringing a family groceries on the weekend. It is my greatest hope to be a positive influence in my students’ lives. Authors who write such meaningful and powerful books help teachers to share unforgettable stories that inspire hearts and minds. Any addition to our school library is most welcome! What an amazing lineup! Thank you! Wow, I have been looking forward to this! Win or lose, this is a great shopping list of books to add to my 8th grade class library!! Thank you! Awesome list of books by far ulous authors! Perfect way to keep our middle school students reading for life! Thanks!! What an amazing array of books and a thoughtful way to share your thanks and appreciation to teachers and librarians. Thank you. This gift reminds me of middle school…when our librarian gave me the honor of opening new boxes of books. I sat on the carpet and lifted books from the cardboard boxes, burying my nose in the smell of words!!!! This gift is too kind! Thank you! To engage readers, begin with engaging books. Reading brings the world to my student! What an amazing addition this would be to our world. Thank you so much for loving us! Wonderful list of amazing books! I have read some; looking forward to reading all and sharing with students and my own daughter. You always have our back, Lynda! Thank you for your love & support! I am always looking to add to my class library, the more books I have the better the chances are to match a student up with the one that makes them a reader, or encourage those that already are. Thank you for this contest! What a great set of books to help us inspire our students to read more. My fifth graders get more excited to read when I match them to new books I know they will love. I am eager to share these titles with them. Many of these are titles that my students have loved so much that the books have made their way home and never returned to my library. Some of these are new books that I haven’t introduced to my kiddos, but know they will just adore them. I’m not usually lucky but I’ll try entering anyway. I love middle grade authors, they are such kind and generous people! Thank you Lynda for organizing this! You rock! What a selection! I start my Courageous Characters unit after February break with One for the Murphys, Fish in a Tree, Wonder, and Out of My Mind as book clubs. Lynda Mullaly Hunt, you rock! Totally loved this year’s Global Read Aloud because you rocked it with the author participation. Thanks so much for giving to teachers, it really is appreciated! This is amazing. Thank you, these books are fantastic. Thank you, Lynda, for your generous offer. This is an amazing collection, and my middle grade and teen readers would be grateful for these additions to our collection! This looks like a great collection of books. Fenway and Hattie is one that I am really looking forward to reading. Thank *you*, all…for loving and caring about middle grade kids, to want to provide them with books that help them discover themselves and their world in this time when they are deciding who they are and will be. It brings joy to my work to be able to connect kiddos with books and authors who shape them. Sincere thanks for everything you do to make these books “be” and for your ongoing show of support and love for kids and their teachers and librarians, too. Love that you are doing this! Great selection for a library. You never know what the right book will do for a student. Thank you so much for this amazing giveaway that will benefit the winning teacher/librarian and their students so much! We love MG authors too! Thanks Lynda for supporting not only teachers and librarians, but most importantly, students! This is an exceptional giveaway. THANK YOU. This is why I love this community so much. Because we know whoever wins will be passing all these books forward to kids. Thank you so much for the chance to share these amazing books with my students! My class has read Fish in a Tree through the Global Read Aloud and was truly inspired by the story. Although we read it months ago, it often still comes up in our daily conversations. Oh my goodness! So many wonderful books I’ve read and loved and have become a staple in my classroom library and now so many new ones to add and introduce to my students! Thank you for offering these favorite titles and introducing me to new ones! What an awesome give away. New books ignite passion in students and we are often not given money for new books. Thank you for your generosity! What an amazing list of books. So many favorites to share with students. Thanks authors for all the book love. Books are to teachers what candy is to children! Just can’t get enough! Thanks for putting this terrific collection of books together … You are amazing in your work and have touched many students lives with your writing, Lynda! This is an amazing set of books! Thank you so much for everything you do to help get books into the hands of young readers! Lynda – thanks for showing your love of teachers and librarians through this wonderful give away. Share the book love! Yes! Wow! This is amazing! What a great selection of books! Fish in a Tree is my next read aloud! My fourth grade library would definitely benefit with all of these books! Thanks! This is an amazing list of books! Muchas gracias Lynda & Authors for doing this! Wow! What an awesome and generous pile of books! It is wonderful that you recognize teachers and librarians for persevering in a job that is often very difficult and thankless. But with this massive book giveaway, it’s going to be kids who are the winners. I work in a school where the kids live in very unhappy circumstances. But whatever they’re facing at home: economic uncertainty, hunger, domestic violence, neighborhood crime – they know that they are safe and cared for at school. Independent reading of high-quality literature that they can choose is one of the things our students know they can use to lift themselves out of their circumstances. They are improving their reading skills, and they are stepping into other worlds to escape their own turmoil for a little while. There are many titles in this list that my students would go bananas for! Thank you for giving kids the opportunity to enjoy these books! Thank you for helping teachers feel loved and getting books into the hands of kids!!! What a fantastic giveaway! I’d love these books to add to our school library collection. I 💙 MG! Wow that is an amazing line-up of books that students are already clamoring for or will. As a librarian in a low income area I love getting books into my student’s hands because they often don’t have access otherwise. We;re having a Superintendent’s Read in our district with Fish in a Tree. So many other good books here I think we;ll have to follow up with another community reading event! What amazing gifts these books are/will be to our MS students. I have always felt that YA lit is food for the soul, and the book listed here are no different. As I read about each book, I thought about how each book could connect to a “reader” I have, to an issue one of my students is struggling with, to a topic that would bring about awareness, to a topic that students want to discuss, to a book that could be the key to understanding, feeling accepted, or to unlocking the door to becoming a reader. As a mother and a teacher, the greatest challenge is to find the right books to get/keep students reading; this list includes books that already do that and others that certainly will- what a wonderful give away! Good luck to all! just re-read directions (why are librarians always the last to read directions) and need to use my school email! Authors are rock stars in my book and in my classroom. I make sure that my students understand the person behind the words he/she writes. Authors are such great people. I love making connections to them with my students. Some of these authors in this give-away I have met in person. What an amazing gift! I am humbled every day by the generosity of the amazing authors online. You give of your time and the books we adore. Thank you Lynda for organizing this incredible book give away! I recently applied for an internal shift from fourth grade teacher to media specialist in our new elementary school opening in the fall and I got the job. It is my hope to share with all my classroom teachers the unbelievable #booklove resources available in the online community. The power to impact children is immense and I feel so grateful to have begun to realize the potential of this medium via great educators, authors and illustrators. Happy Valentine’s Day! Thanks for sharing the book love! What at an awesome bunch of books to be all in one awesome giveaway! My kids would love to get their hands on those books and they would be prized possessions in our classroom library! Amazing books and authors! I would love to add these to my classroom library! WOW! Such a generous giveaway. 😊 As a 6th grade teacher, I know I speak for many when I say teachers and students are just as appreciative of MG authors as they are of us. Thank you for continuing to inspire readers of all ages! We all try to do everything we can for our students on a daily basis. It’s opportunities such as these that make it just a little bit easier for us. Thank you so much for organizing this and recognizing our hard work and dedication! This is so generous! Thank you! You are an incredible person! So many great books to love and share with my students! I am imagining their faces as they open this box of book love – pure joy! Holy cow! I can’t believe this line up of books. These authors are truly rock stars to me and my students. Thank you for organizing this Lynda, and thank you to all of the authors who participated. Many of you have literally changed the life of a reader. Some teacher is going to have a VERY special classroom library. A fabulous line up of books! But more importantly, thank you, from the bottom of my heart, for supporting teachers. It’s a hard, hard, job right now and it’s nice to know there are people behind us! Sharing books with kids is my favorite part of teaching. Recently started “book raffles” to determine who gets to read the newest books. Amazing how this has generated excitement over reading!!! Thank you for supporting teachers and students with this amazing giveaway. Whoever wins is one lucky teacher! By allowing us to walk in others’ shoes, books are the best teachers of empathy! Not to mention the beautiful, exciting places they take us! Wonderful books and fabulous authors!! As a teacher, I appreciate your help in reaching my students. Trust me, they are such special people and deserve finding just the right book to begin a love for reading!! THIS…..is………AMAZING!!! Thank you for putting this giveaway together. My students and I would love and treasure these books. You continue to inspire us! While I love this giveaway, it’s been wonderful to even go through the comments and see how grateful teachers are. To see comments thanking authors for writing and donating their books. To see comments about putting these books into the hands of readers. More and more teachers are seeing the power of books. That’s exciting. Carry on, author friends! The power of the book! There is a true book about foater kids you must read – Walk to Beautiful by Jimmy Wayne ( country singer). I could see a fabulous partnership here. Love this line-up of books! Thanks for doing this! Many students will benefit! What a fabulous line-up of books! I will never tire of the rush I get when a student asks to borrow a new book I’ve brought into the classroom. The conversation we have after they’ve finished reading is precious. Sometimes it cements a connection between us I’ve longed to make. Thank you, authors, for sharing your talents. Love when my students discover that what they are reading is connected to something else in their lives! Wow! Those books would be an amazing addition to any classroom library. WONDERFUL! My 6th grade kiddos loved reading Fish In a Tree this year for the Global Read Aloud. After reading your book, they begged me to start a book club for 6th-&Athens grade students. Now, we have a book club that not only reads and discusses a variety of diverse literature, but also works to enhance literacy awareness throughout our homes, school, and community! Our big project of the year is to build a Little Free Library in our village! The closest public library is 10 miles away, and our school “library” is a closet with 4 bookshelves and no librarian! So… THANK YOU! For inspiring my students! What an amazing give away! Every student in my class could find something they would love to read in this line up! THANK YOU authors for writing the books kids need, and for your incredible generosity. As a MS librarian, I love you all, and am so grateful to you. On Valentine’s Day, I tell my students I am a matchmaker, and it is my job to find that perfect “Goldilocks” just right book for each and every one of them. I also believe that owning books– keeping them for themselves– makes them more special for kids. I often buy books for students with my own money, used mostly, or new. With this package, I could make a LOT of kids feel special. Whoever it goes to, it will bring smiles to so many little faces! You are the BEST! What a great list Lynda! Thank you so much for writing the books that we hope to find and give to kids! Again, thank you! I have goosebumps at this line up! As a 5th grade teacher now taking classes to become a Teacher Librarian, I would do anything to get these amazing books into my school. Many of the authors in this bundle have propelled me into thinking about becoming a librarian… Loving books is my passion! Thank you for this amazing opportunity! The power of a beautifully written story inspires young writers, encourages empathy, and grows readers. Thank you to all the contributing authors. This is fantastic! A great way to get books into the hands of my students! Looking at each title, I can see the face of the student I can picture reading it. This is such a generous gift! What a wonderful gift for any person in education to receive. The list of titles is amazing! Happy Valentine’s Day to everyone involved. These look like a fantastic addition to any middle school classroom library. I love getting kids hooked on reading. As a middle school reading interventionist, I am always looking for great books to recommend to my kids, to try to help them develop a love for reading. There are some wonderful books on this list. I teach two Reading Intervention classes for students in 7th and 8th grade who are reading below grade level. It is a challenge to get these kids to read – I hear all the time “I hate reading!” so I am always looking for books to engage them. What a wonderful list of books to share with my students! Thank you! I use read alouds everyday with reluctant middle school readers to increase their interest in reading. I would love to add these great titles to my classroom library. Wow! You have collected an amazing selection of titles to engage the middle grade reader and teacher! This selection includes obstacles, empathy, perseverance, family, and so much more! Your gift of giving will help others receive the gift of READING! Thank you for your contribution to advocating for literacy! What an exciting possibility! My students would be so happy to have this pile of fantastic new books in the library. What an awesome giveaway! Also, what an amazing demonstration of support for your fellow authors as an example for our students 🙂 thank you! First-year teachers love free books! Especially when they are such great titles! What an amazing giveaway, I’ve been wanting to read many of these to preview them for my students! Thanks for the chance. My favorite question from students is “are we gonna read today?”. And I love when their favorite answer is ” yes, we are!”. What an incredible opportunity to expand our library and the literary discussions in class! This is such an exciting giveaway– there is something here to engage all readers! I love giving new books to my students! This is an unbelievable offer! An awesome prize! My husband’s middle schoolers would love these books. He is working hard to get them interested in what they are reading! I love middle grade books! I love them so much that I haven’t read an adult book in ages, which is ok because I get to give recommendations to my students! Plus I just became certified to be a librarian!!! What a wonderful collection of books you are offering. 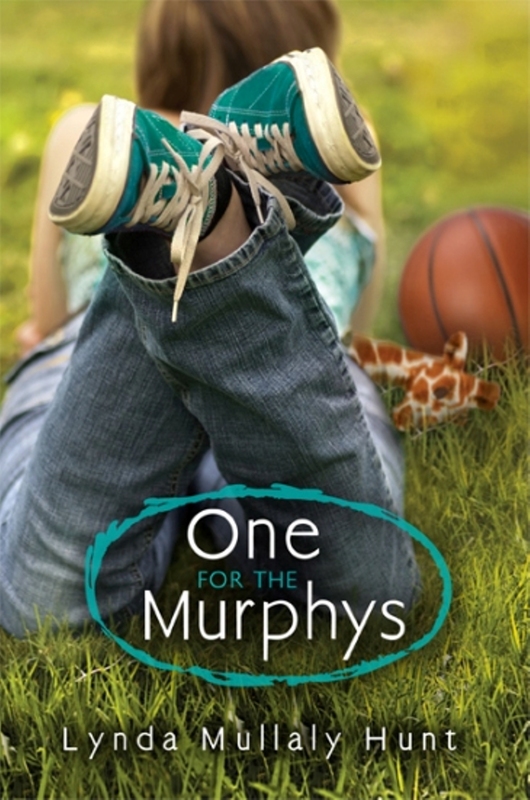 I finally just got to read One for the Murphys (it is constantly out of my library) because a sixth grade girl came to me to tell me how much it meant to her. Wonderful, sensitive, insightful work- thank you. And teachers love authors! Yes, we do try to get the right books in the hands of every reader- and we can book talk forever. 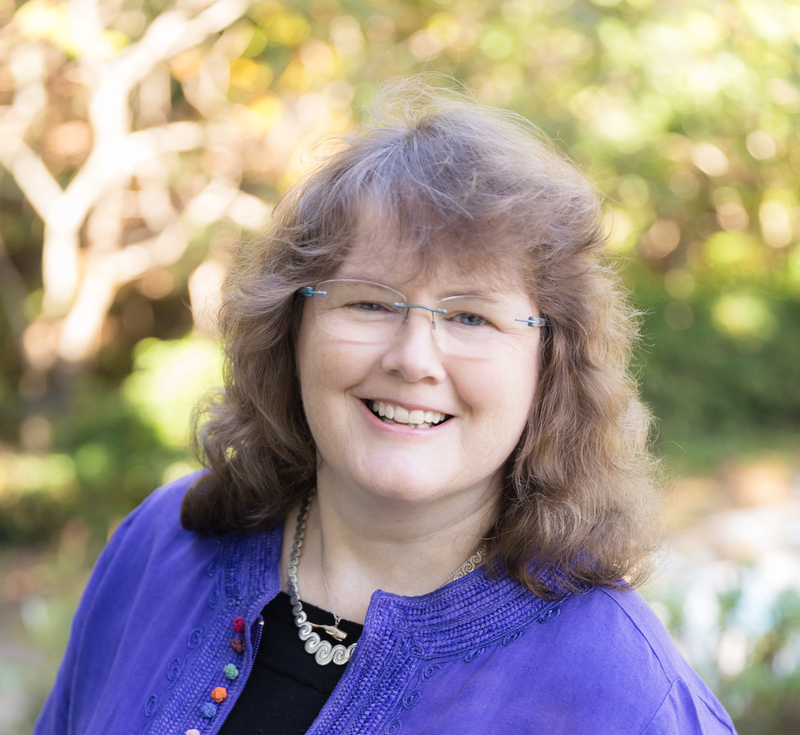 But, nothing beats the personal author connection, so thank YOU for your tweets, blog posts, comments…. all the ways you reach out to readers (and teachers). This is an amazing opportunity. That will be on very lucky winner! Thanks for being our hero! My students are already excited to read Rise of the Wolf! I hope we win! What an amazing group of authors who are so generous! I saw multiple titles that my students have read and enjoyed and shared with others. Fish in a Tree (our first read aloud b/c of Global Read Aloud), Wonder, and One for the Murphys are among our favorites! 🙂 Thanks for doing this!! This is such an amazing giveaway. So generous! One for the Murphy’s has been a long-time favorite of mine. Many of these titles are on my tbr and now I have more books to check in to. Thank You! My students would absolutely love any of these books! They’re always looking for new Accelerated Reader books to read. First of all, thanks for the opportunity to win these titles. I am always trying to add to my classroom library. I love to share my love of reading with my students. We are always talking about books. I try to read as many of the books that my students love so that I can have meaningful conversations about the texts and about reading in general. We read silently and independently in our classroom on a daily basis. The books are self selected. There is no requirement for genre or expectation that there will be “follow up questions” or an assignment based on the book. The expectation is that students pick something they love to read and then simply read. I also read aloud twice a day to my students (during their snack times). Once again, this is just for pure enjoyment of really good literature. Reading opens the doors to so many opportunities and learning to love an appreciate reading is the handle to opening these doors. 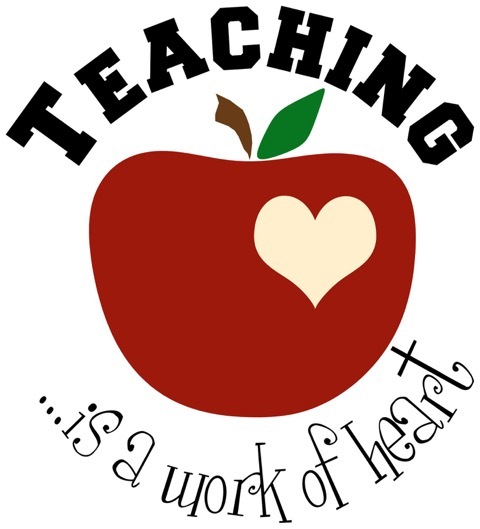 Love the “teaching is a work of heart” logo. Thank you so much for this amazing gift! Your recognition of teachers, librarians and our students is such a Valentine’s Day love gift. Your writing is a gift that keeps on giving by expanding our world view in such powerful ways. Fish in a Tree is bound to be a classic! It is greatly loved at our middle school. Thanks to authors like you, my students are finding their reading identities! It’s heartwarming to see them walking out of school with a book in their hands to read in the bus ride home! Thank you to all these authors for writing books kids, and adults, want to read!! Wonderful books that all can enjoy. Fish in a Tree was our first read aloud this year. The students couldn’t get enough of it. I can’t wait to share titles of the books that are not released yet to provide the anticipation of another good read. Thank you for your generosity. Awesome! Great books that I would love to add to my library. Wow! Some of these books I’ve read, some are on my TBR list, and the rest I’d love to add to my TBR list! Thank you for this great opportunity! What a great list of MY books! I’ve read a few of these and it looks like I’ll have to add a few more to my to-read list. Too cool! So very kind of the authors listed here. I know so many of your hearts. This is really special. If I win, I’m sharing all over our district! This is fantastic! What an amazing gift for a lucky librarian or teacher! I love that authors, teachers, and librarians work together to support the reading lives of kids! Wow! My students and I, from Kamloops, BC, Canada, would love these novels! What a selection! Thanks for the chance to win!! Oh my goodness gracious!!! Starstruck and awed at this giveaway! What a fantastic display of generosity. I would love to connect these amazing books with readers. I can’t say enough about this! Excited to see who is the lucky winner!!! It always seems that on those days where I’m feeling worn down or even a little unappreciated, a student will some up to me and tell me how much they loved the book I recommended to them. Then we launch into a discussion about that title. These moments make me remember why I love my job as a school librarian! These books look amazing (and I’ve even read a couple of them already). I would LOVE to get them into the hands of eager readers. Thank you for this opportunity. This is one amazing lineup! There is nothing more that my students (and I!) love than new books! Our library budget tends to dry up by this time of year, so my students would be psyched for new stuff. Thank you to all these fantastic authors for this giveaway! What an incredible group of books and authors. Some are favorites and others are waiting to be read by my afterschool book club, Book Bandits, for 4th and 5th graders. Thank you. What a wonderful collection of books!! My students get so excited this year when we get new books; I even have students creating “waiting lists” for books! My middle school students would be BLOWN AWAY by this collection of books! With no funds at the middle school, I often donate new and gently used books – this collection would be so, so amazing! The kids are always requesting new books, and many teachers and the librarian often purchase books out of pocket to meet their requests. We love growing thirsty readers – these would help so much! Thank you Lynda and all of the authors of this amazing line up, for writing books, that we as teachers and librarians ,are honored to put in the hands of our students. Of course I’d LOVE to win these books, but also a great list of things to read and watch for. Thanks for your generosity. Lynda–Thank you for spreading your book love to our students. They will be thrilled to know that my/their favorite author hosted this incredible giveaway! What a great give away! Kudos to the authors! BOOKS BOOKS SO MANY BOOKS! Hope you feel the love for me when you pick the winner! What a generous and heartwarming offer. Thank you for the kind words! Thank you such a wonderful opportunity to put quality books into the hands of our middle school aged students. I love hearing my students ask me: When can I start my a new book? When are we starting our new book groups? Can we read all of class? My students will appreciate new books to check out. This is so totally awesome. Teacher librarians can be a very humble and quiet bunch but we greatly appreciate anything we can get our hands on for kids to read…it’s even more special coming from great authors like yourself. Wow, these are some fabulous reads! Kids love books, for real, and having good books available can only feed that love! Thank you for sharing the ❤️Book Love❤️ with teachers. What a treasure trove! Nice selection indeed. These would be a wonderful addition to any classroom library…especially mine! These would make awesome entries in our school’s annual March Madness of Books tourney to select our school’s Book of the Year! It would be great to add these new titles to our collection. My fifth grade students love many of these books but loved our skype author visit with Lynda Mullally Hunt. We had fantastic discussions reading Fish in a Tree and currently are reading Wonder. What an amazing collection of books! This is such an amazing giveaway! As a middle school teacher for 9 years, I would LOVE the ability to expand my classroom library without having to quickly deplete my small classroom budget. Thanks so much for the opportunity! This year, instead of focusing as much on having my students read the required 20 minutes a day, I’ve tried to instill a love for books. I’ve challenged them to read 30 books from 9 different genres. I’ve stepped up my commitment as a teacher to broaden my reading and model that to my students. I try to share the amazing stories I’ve read with them and have them also share the stories that excite them. To my surprise, they are talking to each other about their books! I would love to continue to share books with them—like these titles, to continue to inspire them and grow their love of reading! So honored and blessed to be remembered by authors of MG novels that we share with students each day. Thank you for the Valentine Book giveaway! For 22 years I’ve loved teaching reading. A few years ago I moved from 5th grade to 2nd grade and traded all my middle school literature for picture books and early chapter books. I am now in middle school again, where I belong, and I am missing my classroom library! Finding the perfect book to teach a skill, a life lesson, or most importantly a passion for learning is difficult without my personal books. I miss them! I am longing to be able to light a fire in my students! Thank you for such an awesome opportunity! #MGAuthorsLoveTeachers. My students are enjoying independent reading and would be excited for new books! I have been teaching reading for years and every day, former students come into my room for a book. I have THE best selection in my classroom and can always find something they will love! These books would make a wonderful addition to my personal classroom library! Love seeing all these book covers. Thank you for posting them. On my bulletin board, I have my students make a color copy of the books they book talk. By doing this, each student has a visual of the books which are shared with them. Now with books being in so many different forms, digital and accessible in hard and soft copy, it still is important for them to have a visual of the cover. Thank you! I just finished reading FIAT to my students! So many beautiful lessons: figurative language, point of view, character development, growth mindset, and staying true to yourself! Love how we fall in love with characters in a book! Thank you, Ally, for inspiring us to always give our best. Mr. Daniels, you rock too! The most important job of educators is to put the latest and greatest books in the hand of our children. WOW! What an amazing and generous gift! If I won I would pass them on to the amazing teachers at my school for their classroom libraries. Our 4th graders are still talking about “Fish in a Tree” from GRA! Lynda, you’ve done it again! Getting everyone excited about reading and now, the opportunity to build upon a classroom library with new book releases! You Rock and more importantly, you continue to inspires both students and teachers to continue reading. Thank you for all that you do!!! Love igniting or stoking the flames of passion for readers in Middle Schoolers. Just finished The Looking Glass Wars by Frank Beddor with my 8th graders, and even mymost reluctant readers found it enthralling to read!! Thesebooks will make any teacher’s library a wonderland! I am creating take home cuddle bags for my low level readers to promote literacy and cuddling up with a good book. These titles would make an amazing addition to my project. So many great comments!.The right book, at the right time, can and will save a child! What a great collection! ! So many on my wish list and more I didn’t know! Thanks for sharing the love of reading with teachers so we can share it with our students! Unfortunately I have not the privilege of reading these novels just yet. I’m a new teacher with a small middle school class and I am pleased to see that authors are excited to share their works with teachers and librarians. Thank you for this opportunity. I also try to put the right book in the right hands of my students and my overall goal as a teacher is to share a lifetime of the love of reading. My 5th graders and I credit Fish In A Tree and the 2015 GRA with building a trusting and loving learning community. Great teaching is easy when there are authors like Lynda providing compelling lit!!! Books bring magic and learning into the classroom. There is not a day that goes by that I don’t think about books. I’ve always loved books and sharing my passion with my students brings me great joy. I believe teachers should share their love of reading with their students as its a powerful way to promote this magical skill. If my Ramona Recommends little heart was picked for this glorious line up of books it would make my year! Can’t wait to Open The Magic!! What a generous giveaway! Thank you Linda for being so kind. My 3/4 class loved Fish In A Tree (that we read during GRA). By far the BEST giveaway ever!! I love to read and love to share that passion with my students! What a great smattering of books. My students will love these. Thanks for supporting classroom libraries. It’s so important and a way to keep students reading. My students love smelling new books when they come in. It’s so cute. Thanks for supporting teachers as you always do. #MGAuthorsLoveTeachers Lynda, what an amazing gift for our students. What a way to build classroom libraries. You are a true gift to all readers. I’m not sure if you know how much this means to a classroom teacher who spends so much of her own money to have a quality classroom library. I appreciate “you”,the authors, who are writing these amazing books to foster the love of reading. Turning book nerds is my goal, your books are the means to that goal. Thank you! What a wonderful list of books! I have read a few and they are among my favorite! Wow! What an amazing list of books! When the school year started, I found myself in a classroom full on non-readers. They didn’t want to read… nor did they want me to read to them. Unfortunately, school had killed the love of reading for many of them. Furthermore, my students felt as though they were “too big” for read aloud time. Well, my class quickly found out that read aloud time is part of my daily routine. I am passionate about reading and hope to foster the love of reading in my students. My students we hooked when I read Fish in a Tree during the Global Read Aloud. My students BEGGED me to read. The collection of books in this giveaway would make a huge impact in my classroom. I now have a class of readers and they can’t seem to get enough. Our library funding has been drastically reduced and my students constantly tell me that they would like a better selection of books. I’m sure any teacher would be honored to be chosen as the winner! Thank you for this giveaway. Your dedication to education is appreciated! My class Twitter is @AlbertsonClass. I’m sorry… the first reply was incorrect. My class Twitter is @AlbertsonsClass. Well, here’s the thing, I know that my teacher friends are super. I also know that my school librarian friends are awesome. Furthermore, I can assure anyone reading this that several of the previous writers have been friends of the teaching and the librarianing type. What makes my day? When a student declares that a book “was the best book ever” and then asks for another one like it. Then later when the next book is returned, it, too, was “the best book ever.” Another wonderful thing – the teacher who asked me for a reading list for over vacation. So wonderful. My students loved FIAT and we were so grateful to listen to your thinking behind the story! We are so glad there are authors writing stories that inspire and connect with 5th graders. Thanks for sharing with us and we would love to have these 30 titles in our classroom library! This is an amazing giveaway! I’ve been looking for ways to get more books into the hands of my students. Thank you! We appreciate it! There are many awesome books on this list! Would love to booktalk them to my middle school students. I need more time to read! Spreading the word on FB and Twitter, but really hoping to win this for my school! Feeling the love! Love the book give away! I am a new grade 6 teacher and have some guest readers talk about some of the books on your list. These books would be a welcome addition to my small classroom library! This is an amazing giveaway! I know my middle schoolers are obsessed with some of these titles, and we could always use more new-releases in our library! Love, love, love! Thank you fabulous authors! What an incredible and generous idea. So fitting for Valentine’s Day. My first love in life was reading. As teachers, we strive everyday to pass that love on to our students. Definitely some books on this list that would inspire that love in students! Wow, great books! When I get excited about reading and sharing books, then my students get excited about reading and sharing books. Thank you to the authors out there that strive for that excitement. Thank you for your recognition and generosity! Sharing books with pretend and watching them discover great literature is one of the joys and privileges of teaching! Wow! An amazing gift of books. Looking forward to the 10 soon to be released books. Thank you for this incredible give away! Wow! What a generous giveaway! Thank you for saying that you all appreciate what we do for middle grade children, but I would like to say thank YOU for all the amazing stories you all share with the children we work with everyday. All the authors in this giveaway make my job as a school librarian so much easier! Providing excellent stories that are relevant, current, and compelling to read for these children helps develop their love of reading and makes their journey to becoming a lifelong reader possible. Also, what I love about the authors above is that they have also created stories that adults enjoy and look forward to sharing with their students! Thank you! I already see two of my all time favorites on this list!! Whoever wins will have their summer reading ready and waiting for them. I always read them before I read them aloud to my students or a book club setting. Happy Reading! This makes my librarian heart flutter, what great titles and amazing generosity! Thank you for this opportunity for my students and I. Happy Valentine’s Day! Awesome giveaway! Great books; some are already my kiddos faves! Thanks so much for this opportunity to continue to promote books and reading with my students. What an amazing way to get books into the hands of students! Thanks for all you do! What a terrific selection of books for librarians to share with their students. Thank you! Wow! What an amazing thank you to teachers and librarians everywhere! Happy Valentine’s Day!! Holy cow! Thank you to all of these authors for being so generous! I can’t wait to read a number of the books in this list!! I would love to read and share these books. So many wonderful books and such generosity! Thank you. I will be happy to reblog and tweet this giveaway! As an elementary school librarian, middle grade authors are my rock stars. This is a very generous offer, and a great opportunity to get more kids reading. Thank you! Thank you for taking the time to think of all of the teachers and librarians! I know my kids love Book Soup; where we just talk about books during lunch once a week. Some of these titles have come up with them, others are new. I’m going to share this list with them! Thanks so much for doing this! What great books to get into the hands of young readers. Thursdays are our favorite days in Room106. Thursdays are Library Days. Our librarian rocks. Boy — it would be so cool to read all of these…first time tweeter, hope it worked! I always have students write down books they want, but can’t afford. Then, I buy some off their list. These would be well used! Thanks for the teacher shout out! We have such amazing authors writing amazing books for amazing kids!! What an amazing set of books! Every day I try to create excitement for books and put books into kids hands. I have a waiting list in my classroom for FIAT, and I feel everyone should read that wonderful book! Thank you for this offer!! The book selection is fabulous and such a generous gift! Students everywhere will love to read them (adults as well). More importantly, thank you for the kind words you share for all educators and media specialists. We appreciate them! Wow, this is so wonderful. I’m going to share this on Twitter right now. I work as a Special Education teacher at a middle school in Fitchburg, MA. I will donate these books to our school library. Thank you, thank you, thank you! For helping bring reading opportunities to students! As a librarian, who has had the opportunity to see many of these authors on the Vermont state lists in the past, I look forward to sharing these books with the middle schoolers at our small rural school. What a great opportunity to put so many great books into my students’ hands. Thank you! What a great contest! These titles would make a great addition to any teacher’s bookshelf. Thank you for your kind words and for sponsoring this giveaway. Also a big thank you for the swag @NCTE. My students are still wearing their bracelets and refer to Ally and her friends often in our conversations. Continued success to you! Omg, thr students at my school would LOVE this. !!!! Thank you! Awesome giveaway! Lots of great books! Thanks for the chance to improve our classroom library! You are an amazing human being and I share your books with all that allow me. I am currently working on obtaining my Master’s degree in School Librarianship so I can spread book love, not to just 25 students per year but hundreds! It is a lot of work but so worth it! Thank you for all you do for teachers and librarians and readers! What an incredible gift for a lucky teacher and his/her students! Such fabulous titles, many I’ve read, others I have wanted to read, and still others I’d never heard of. Thanks you, Linda, for your generosity. Wow! What a amazing and generous gift of books! I strive to share my love of reading every day with our students, and I see so many that they would enjoy and share with others. What a collection! I know my students would swoon over these books! Thank you so much for your generosity! Being a primary teacher, I haven’t read yet and won’t use most of these titles in class…but just looking at them reminds me of the very special role that middle-grade novels play in the development of children’s hearts and heads. I could so easily make a similar list of the books I read between 2nd and 7th grade! I would love to win this collection for our school, and thanks, authors, for noticing our heroism. Between us we change the world every day! What a beautiful list of books. Don’t know someone more deserving than Aimee Smoker, 6th grade school teacher with the sweetest love and open heart for children that craves the joy of reading. What a better way to share her love for reading w all of her students! Good Luck Aimee! Such an amazing giveaway! Excited to see some if my favorites like Ine for the Murphys & The War that Saved my Life on the list! My students get so excited about new books in our library! This collection would be an EPIC book raffle! You all provide us with some great books that we pass on to our students! Thank you! Thank you to all of the authors for writing such great books for middle grades. If I win, I will be giving the books to classroom teachers to read to students and add to their classroom libraries. I will be purchasing the titles we don’t already have to add to our school library collection. Thank you. Great books–they would be welcome additions to my library at the Ohio School for the Deaf! This is such a huge giveaway from authors that will grace classroom libraries. Lynda, your generosity in organizing such an amazing feat is wonderful. Books are the heart of each classroom and lifelong friends. Authors like you make it easy to put great books in students’ hands! I would love to have all of these books in my school library. Thank you for the Teacher Librarian love and an opportunity to win a Fantastico set of utterly incredible books! THANK YOU! These are wonderful titles. I am switching from 7th grade writing to 7th grade ELA next year, so I will need to add to my middle readers collection. It has been two years since I taught reading. I love when I find new books to share with students. Thanks for adding to my reading list. What a great book giveaway! My students are always excited when we get new books, and this list is fabulous! Without wonderful writers, like YOU, we couldn’t get those students who have not yet fallen in love with reading to do so!! One of my fav parts of teaching is finding that book that starts the reading excitement. Often, it is one of the showcased authors above. Thank you! Great books and great giveaway! Thank you! What an amazing giveaway! These are amazing books. May of which I have recommended to my students this year to read. I am so thankful for all the wonderful authors offering up such wonderful books. Wouldn’t it be amazing to win?? WOW! What a great gift for my students if I were to win!! Fingers crossed!! Thank you! Oh my WOW! What an amazing giveaway. My goosebumps got goosebumps. I so agree on creating conversations that help match books and students. That is something I am working on at our school this year. Creating conversations that go beyond the library and bring together all our students and staff dorm grade 7 to 12. We are on our way to building a reading community that talks about and recommends books to each other. Thanks for this chance to win these books…and signed…more connections!! I love how strangers of different ages, genders, and purpose can start instant conversations when a common title read or reading is discovered. Sometimes those conversations are silent head thoughts shared with knowing smiles. So many times I want us to be able to go up and meet the characters who nudge their permanence into our minds and hearts. Even the ones who sometimes scare us. Awesome book lineup! These books would be great additions to my school library collection.Thank you for this offer! I love reading the books my students are reading! I enjoy when they suggest books I might enjoy or when they are interested in a book I am reading. This is a great bundle of books! My students would love these! This is a fantastic list of books! I am looking for MG LGBTQ reading – any suggestions? What a great joy it would be to add these books to my class library to enjoy with my students! Wow! What a fantastic list! Thanks for your generosity. I’m entering the contest right now. What a fantastic idea and an exciting collection of books. These titles will open doors and windows and reveal mirrors for a lucky group of readers. I would be honored to share these books with students. Thank you for your generosity and creativity! Thank you for the thanks! My third graders are avid middle grade readers, and it is so wonderful to find new titles for them that are challenging and engaging. Will definitely be checking many of these titles out, whether I win or not! What an incredible collection of MG marvels! Thank you for organizing this wonderful giveaway! What an awesome gift this would be for the school library. These would definitely help develop and nourish the students imaginations, as well as, give them the opportunity to experience life and create emotional bonds. Always looking for a “Great Escape” with a book! This is an incredible list of titles, and my middle grade readers would scoff these up with relish. Last year we launched a new and improved reading program, and the middle grade students are on fire for reading. I find I can’t keep up with demand, and this giveaway would be absolutely amazing. Thank you for offering this generous collection to one lucky teacher/librarian! This is an amazing Such a great variety of authors and genres (and the prospect of getting yet-to-be-released 2016 titles is awesome!) I am a middle school librarian and recently started in an impoverished school with a high mobility rate. My favorite part of my job is connecting a reader with the right book. When I meet a student who says, “I don’t like to read,” I tell them that my challenge is to change that thinking with the right book. Books change lives! 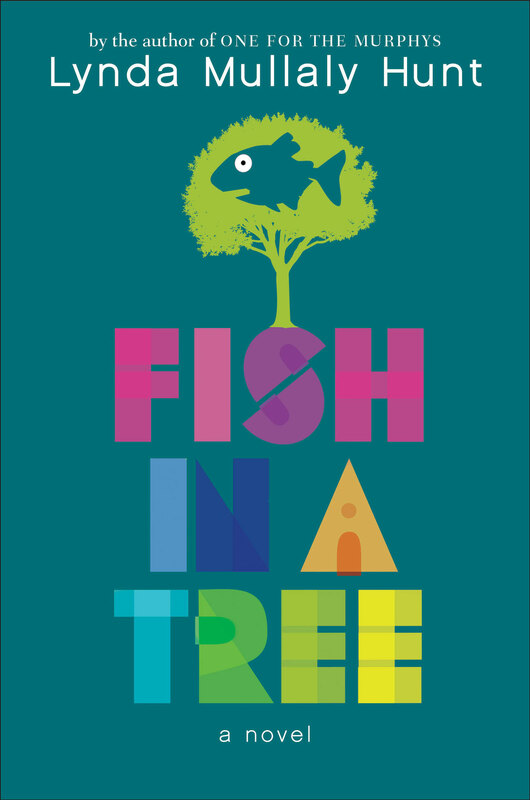 Your book Fish in a Tree is part of our You Decide. We pick 5 books for each grade level and students are encouraged to read as many titles as they can. Then, in the spring we have a celebration of reading. We chose your book as our class read aloud. My sixes are loving it! They’d be thrilled to have so many books added to our classroom library! This is an amazing list! Thank you all for writing books that inspire a love for reading! Oh my goodness.What a wonderful array of books up for grabs! Wow! What a generous prize! I am a middle school librarian and know that my students would cherish this list of books! Good luck to all and thank you to Lynda for hosting such a thoughtful offer! What a fabulous giveaway! LOVE discovering your work in my 2015 favorite reads! Fish in a Tree is one of the most checked out of my library! Wow, what an amazing lineup of books! My middle school grew by about 200 students this year, so I have more chances than ever to connect readers eith the perfect book in our school library. Thanks for supporting teachers and librarians! Just finished a fantastic book: “The Thing About Jellyfish” by Ali Benjamin. can’t wait to read books on this list! LOVE my job as a school librarian! Several of these books have gotten my students (grades 4-6) excited about reading. I can’t wait to read the 2016 releases. Thank you to all the participating authors! This is such a generous opportunity for middle grades and other readers who enjoy young adult fiction. Just the boost reluctant readers and avid readers need to satisfy their reading goals. Teachers as readers create the highest achievers!! Great giveaway. I have many of these titles in my school library and they are popular! The Book Line UP is not only amazing it is a list of some of the most relevant books for young adolescents and their teachers too! My students would be so fortunate to have access to these books in our meager library! I’ve read Fish in a Tree and One for the Murphys. Loved both! I would be thrilled to win the rest for my 6th grade class library! Wow! What a great list of books! Crossing my fingers because all these books will be donated to my school’s Family Reading Night. We like the students to go home with as many books as possible. Wow! What an amazing collection of books. Any classroom library would be thrilled to add these titles. Thanks for the opportunity. SO many of these books on my loved or to-read list! What a great giveaway! What an amazing prize! 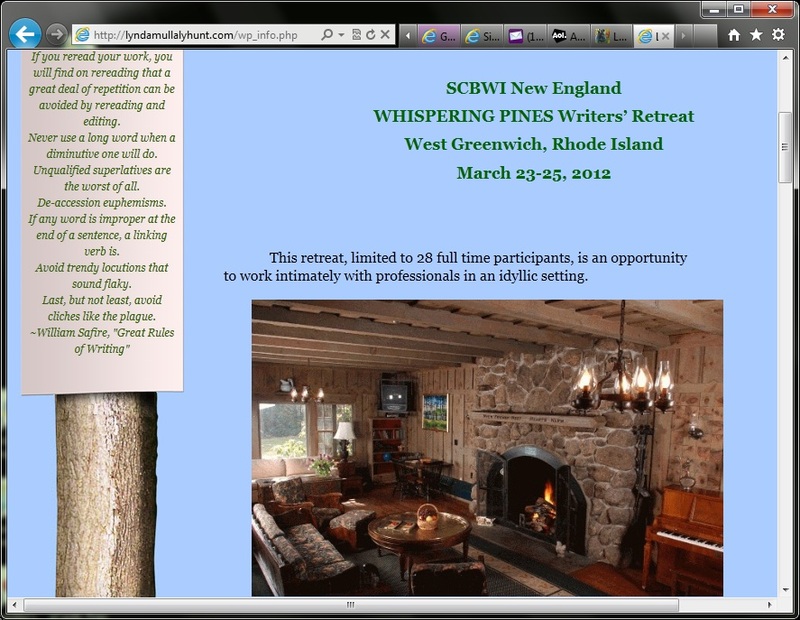 I really want to win this for my students! I participated in the Global Read Aloud this year and my 5th graders loved Fish In A Tree. I’ve made so many awesome connections through Twitter and the GRA year. Thank you for supporting teachers. Keep the great literature coming! I love providing books for my students! Oh my. This is a middle grade teacher’s dream come true. Amazing selection by amazing authors. I’ve read some of these great books, but many are new to me. Wonderful giveaway. On my second read aloud of Fish in a Tree for the year. Kids love it every time! Winning this collection of books alone would be A.Maze.Ing. All of them being signed by the authors…just wow. It would be a silver-dollar day for this teacher-librarian for sure. Thank you doesn’t even cover it. When authors and teachers come together great things can happen for kids! Hoping to get these great books to put in the hands of students (after I read them first, of course, so I know what best suits the students)! Some personal favorites are on this list! Wonder and Fish in a Tree are extraordinary books! Highly recommend them both. You KNOW what teachers like – books in kids’ hands and hearts! Thanks for giving away even MORE! I’ll always treasure the Skype we had for our lunch time girls’ group, when we read One for the Murphys! Whoever wins this loot will treasure each book, as well. You matter! Love both Wonder and Fish in a Tree! I love being able to go to work and enjoy spending my time with the future of our country. Wow, this is such a neat giveaway! Thank you for honoring teachers, especially those who teach reading. I’m a 7th and 8th grade Language Arts teacher, and teaching reading is my passion and honor! What a wonderful collection for middle grade readers. Thank you for sharing. I can’t wait to add some of the titles to our collection. Looking forward to book talking many of the titles. We love authors of middle grade books!! Librarians and Authors partners in putting books in children’s hands! What a generous giveaway for teachers and librarians! I’m always looking for opportunities to stay on the cutting edge of children’s literature in an effort to keep my students engaged and connected. This would certainly help! Amazing books and authors! Would love to win! My students in Orono, Maine, USA will truly appreciate these titles if I win. If not, there are several titles that will definitely become items in my classroom library. I am a fourth grade teacher in MI, I would love the chance to win these books!!! Thanks! These books look awesome! Thanks for organizing such an incredible line up of books for giveaway! Oh my good golly fantasticness! All of those books in one place makes me swoon…and that’s not easy to do when it’s -10 outside. This opportunity is this librarians dream come true! All these books for my little love bugs at school. They will shout and then feel faint. What a giveaway! Incredible titles in the hands of students via teachers and librarians who know and adore them – what could be better? Here’s to reading communities! So many great books! My students would love to get their hands on these! What an awesome line up of books! I am reading Fish in a Tree to my 6th grade students and they love your book!! Providing with every opportunity to read high-quality writing that they choose, and then talking with them about those books is my absolute joy. I love seeing everyone here who has that same passion. We, my friends, are reading warriors! Keep fighting that fight. So many great books on this list by amazing authors. What would my readers do without you? This is a wonderful collection of books that I know that the students at my school would love to see on the library shelves. Some of the books I have read, but some of them are new to me. This is so generous of of you and these authors. With a fixed schefule, I am fortunate to have a full-time media assistant. She and I have worked together to create Brown Bag Book Clubs so while I am teaching, she leads books clubs during students’ lunches. Our goal is to foster a love of reading. No assessments. No responses. No pressure. We have seen amazing growth in reading with these kids, but more importantly is their LOVE of reading! Today, I had a group of boys tell me they were forming their own book club since they didn’t make it into Ms. Ray’s book club! Isn’t that amazing? The love of reading (alone or together) is truly contagious! I am always amazed by YA authors who celebrate and honor teachers when it is teachers who honor and celebrate the writers who inspire, reaffirm, engage, ignite, and comfort our students with stories and words when they think no one else is listening. Thank you for everything that you do and the amazing stories that you have written/have yet to write that save lives every day by making students know their stories count. Imagine the book buzz this collection will make when it arrives in a classroom! So many exciting titles! What a fantastic giveaway! So many great titles that students would love to read. Thank you for your generosity and support! This is a great lineup! So excited about this giveaway. I teach middle school/Jr high students and have many kids that are dying to read some of these gems. Thank you so much for the chance! This is amazing! I can’t even imagine how excited my kids would be to get these, especially signed copies! This is amazing. My library and students would love to have these books. What a great selection! Thank you, Lynda Mullaly-Hunt for inspiring readers with your own books, and for loving the teachers and librarians who work so hard to pass our passion for reading to our kids. Whoa, what an amazing list of books! I know my kids would love quite a few of these. I’ll have to start bookmarking now! I just received my school librarian certification, and I can’t wait to use it! In the meantime, I will continue to fill my classroom library with great books! Wouldn’t this collection be an awesome addition? Thank you to all the authors who make it possible for students to take trips to faraway lands, learn about something new, and learn they are not alone in this world. There are students just like them in this world (even it is in literature) and they can accomplish anything. Thank you for writing about situations that students face every day. I hope I am someone’s hero and are making things possible for them. What an amazing opportunity! It is so important to increase access to high quality text-for both teachers and students-in any way we can! Thanks for offering this. Such an amazing collection of books. As a teacher new to 4th grade, I would love to have these books to add to my classroom library. Thank you for offering this great give away! Teachers love authors, too! Such a wonderful collection of books from some of my favorite Middle Grade authors! I know the students in my Library would be psyched and honored to have these as part of our collection! So many acts of kindness, so many wonderful books to share! I love when I can tell not only a student, but a colleague, “You really need to read this book, you’ll love it!” Thank you to the authors who share their talents and their stories. Thank you to all who are willing to share these books for this thoughtful giveaway. I actually enjoyed reading all the comments from the postings above knowing we all had something in common: a love of reading! Read on! So many books that teach life lessons, for all ages, young and old. What an opportunity! them in ways that we could never imagine Thank you for this gift and for sharing your passion. I can’t get enough of these books!!! My students feel the same way. So many amazing books! My students have been loving many of these this year, and the list has given me more titles to add to my library wish list. Thank you! This is truly amazing! We would be so super excited to win this awesome list of books! Wow!!! My 4th graders LOVED Fish in a Tree this year and I thank you for helping them on their reading journey! What an incredibly kind thing to do for children! 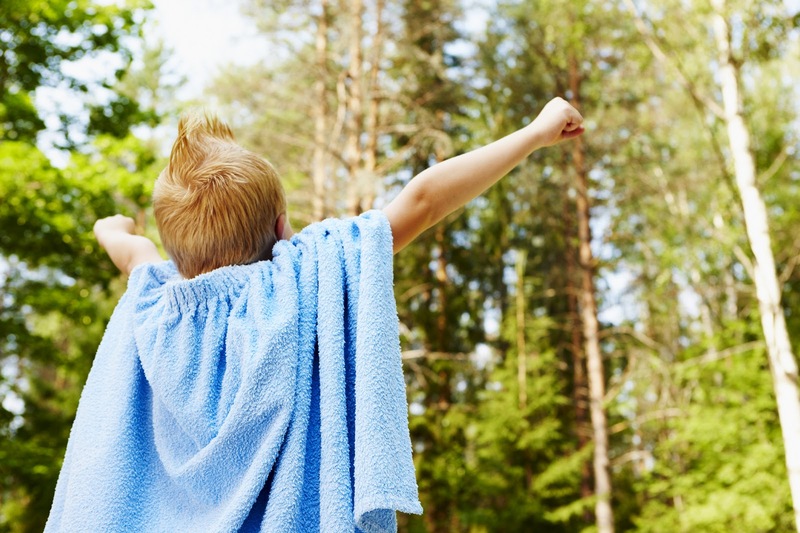 No matter who is chosen, the children in their school will win – and when the kiddos win, we all win. Thanks so much. What a nice idea! Getting kids excited about reading is what keeps me motivated day after day. I love my job as Librarian and love bringing new books to my students! Thanks for doing this! What an amazing selection of books. I have a “new book” basket in my room and every time we put books in that basket we have a celebration. My students would go wild to have this many amazing books to add. We might need a bigger basket. Thanks for all you do to help teachers promote the love of reading. Wow! I would love these books for my classroom. I am trying so hard to get my kiddos to love reading!! So cool! Who doesn’t need more great titles on their library shelves!!? I know I do! In fact, I requested an unlimited budget to buy all the new titles that kids asked for. I think I got laughed at, but hey, if I don’t ask they can’t tell me no…or yes! 🙂 Thanks!! My Twitter account that posted about the contest is @PGMVikings. I realized there was no connection between this post and my Twitter post. What an amazing collection of books! I would love to add them to the book room at our school and to share them with the teachers in our children’s literature study group! Thank you! Wow! What a great list of books/authors, students’ and teachers’ favorites. I can’t think of a better prize! I’ve spent 15 years as a middle school ELA teacher and now I teach a 5/6 blend. I love that moment when “non-readers” find a book they love. To all the authors, thank you for helping me connect kids to your great work. What a blessing for authors to want to connect with teachers this way. I love books! So many great books! Thank you for thinking of us! A book is always a gift, but you have collected a treasure trove of works that will keep on giving for years to come! Fabulous list of books. They would make a great addition to my campus. We are a Title I school and building a high-quality collection for my students is a llriorit. Winning these books would be such a blessing. I will personally catalog these books so that they hit the shelves this school year! What a great selection of books and what a great idea! Can’t wait for tomorrow. Thanks for helping us provide quality literature to our students/patrons! How exciting! As a teacher-librarian, I would love to add these to my collection!! Wow! This is an amazing list of books that students will fall in love with! Middle grade readers have such a wide variety of interests, and the books in this list cover so many of those interests! Thanks for doing this! One of my favorite parts of the job is finding the right book for the right child. I love my job and so excited that I get to meet such great authors and share their books. I just recently recommended Fish in a Tree along to two different colleagues, both of whom are now using it as a read aloud. Such an authentic story that resonates with kids and adults! This fall our 3rd through 5th grade teachers participated in the Global Read Aloud, reading “Fish in a Tree” to their classes. What a fabulous way to start discussions about respect one another in spite of our differences and what students can do to stand up for others who aren’t being treated well! What an amazing collection of books! I think about how many of my fifth grade readers have benefitted from some of these titles already. Thank you for writing books that touch the lives of so many children. What an absolutely wonderful, amazing give away! My students and I would be so thrilled and lucky to be able to add these books to our classroom library! Thank you for your work in putting this together! It is such a blessing to know there are folks who love teachers, librarians, and books! I strive to help pre service teachers develop a passion for reading. Super excited to get these titles into my kiddos hands! Thank for being you! What an amazing selection of books! Fiction, nonfiction, verse…I’d love to have these for my students. Thank you! I would love to get these books into the hands of my students! Great lineup of titles! Thanks for being our reading/writing heroes! I love your post about reading as a door or a window. I posed that question to my 6th graders this year and we had some amazing discussions. One thing that was fascinating was how different they interpreted the question in the first place- for some, it took a lot of discussion just to get them thinking in those terms. After we were all on the same page, I sat back and enjoyed listening to them process the question and bounce ideas off each other. Thanks for putting together this great list of books! Thanks, even more, for writing books they love! I love to be able to put great books in the hands of students to build their love of reading. This is an excellent opportunity! I’m hoping that 10:47 MST on Feb. 20th is not too late to enter. I would be honoured to put these books in the hands of readers. Thanks for the opportunity to enter. I was seriously author struck as I saw that line up of books. Such inspiring books to spark reading! Thank you for supporting teachers, inspiring readers and making the world a better place one book at a time! So many great books on this list. I’ve read quite a few and NEED to read the rest. And share them with my fourth graders! Wow! What a fabulous selection of books! Just seeing all of these covers together reminds me how many books get read in my classroom each year. No classroom can every have too many books! As a reader who reads, I love reading the latest and greatest new titles in order to add them to my collection of old favorites. My students love the choices they have when looking for a new book to read. Thank you Linda for all you do for readers, writers, teachers and students of all ages! My students would be so happy to have these books in our library. Last year my kids fell in love with Allie…this year it’s August! Both Book have made empathy central to our classroom conversations. Thank you for books that not only help me teach literary elements but also character education!